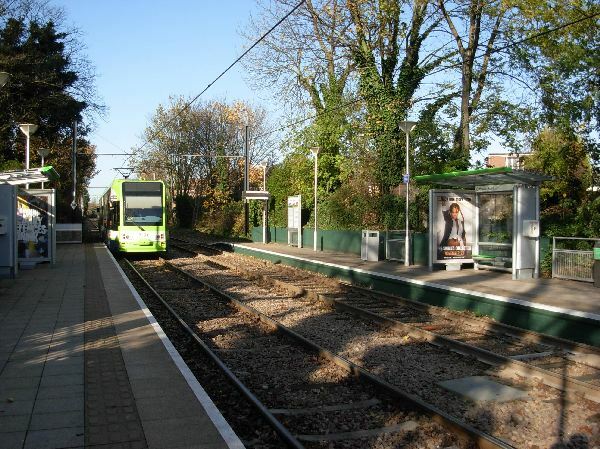 The Croydon Tramlink is a tram built in the 1990s because the borough of Croydon complained about having no convenient access to the Underground network. A tram was chosen rather than a train because tram rails could be set on existing roads across the city centre of Croydon, offering a very valuable link of both train stations with the new line. On this specific walk, the tram uses the route of a former train line opened in 1855 and closed in 1997. The tram started as a private company that kept the ticket proceeds, but changes in the overall London fare system made it ever more complicated to calculate the appropriate compensation payments and the public authorities (TfL) purchased the system in 2008. It is one of several nationalisations that happened in these years in London, several private operators being quite happy to get out of contracts at the time of a financial crisis. The annual compensation payment alone had already risen to about 4% of the final purchase price, more than TfL would need to pay for the debt incurred in purchasing the system. Nearly all stations on the Croydon Tramlink use standardised platform furniture. There is no office or building, just a glass awning and vending machines, and I therefore don’t need to comment on architecture. Please note that the Croydon Tramlink normally uses ticket readers like on a bus, but that a special, highly confusing regulation applies in Wimbledon, potentially causing overcharging. Routing note: This walk connects in Wimbledon with Blackfriars/Thameslink walks 11 and 12, with Waterloo network walk 10 and with Underground District Line walk 6. It connects in Mitcham Junction with Blackfriars/Thameslink walk 9 and with Tramlink walk 2. Please note that two short sections can be muddy or even flooded after heavy rains. You can bypass them easily on paved paths if needed. Sturdy shoes may nonetheless be more comfortable. Please note also that the walk runs along several nature reserves and that your dog will need to be on a leash. This is a venerable train station as it opened as early as 1838 on the train line linking Battersea (extended to Waterloo ten years later) with Woking. An other train company opened a line towards Croydon in 1855; this line is the one that was later converted into the Croydon Tramlink. 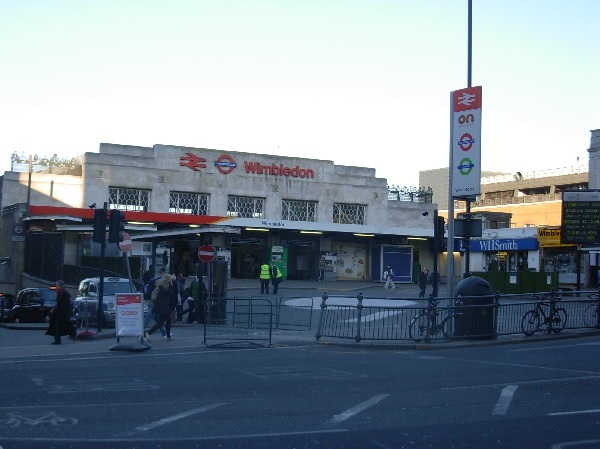 A third train line opened in 1868, linking Wimbledon with Streatham. The present Underground line towards Putney and the West End opened in 1889. Finally, the train line to South Merton opened in 1929 and was extended to Sutton in 1930. The station building was rebuilt in the 1920s in preparation for an expected extension of the Underground towards Sutton. This did not happen due to opposition from the train company serving Sutton, but the building proved quite convenient. Although it looks like concrete, the building is actually clad in much posher Portland stone. It is strikingly Art Déco with very straight lines and no ornaments, and it does not have a first floor as it was not necessary any more to house the station master in the building as was usual in the 19th century. The hall is somewhat confusing inside because it serves no less than 10 platforms with staircases not in a straight line. Train enthusiasts will certainly enjoy this station where the Tramlink, the Underground and two train companies provide a large variety of colours and shapes within a relatively small space. 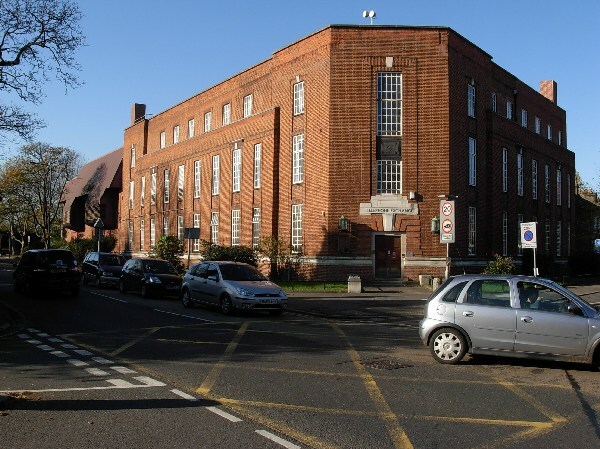 Cross the major road in front of the station and take the public footpath between the two large buildings. 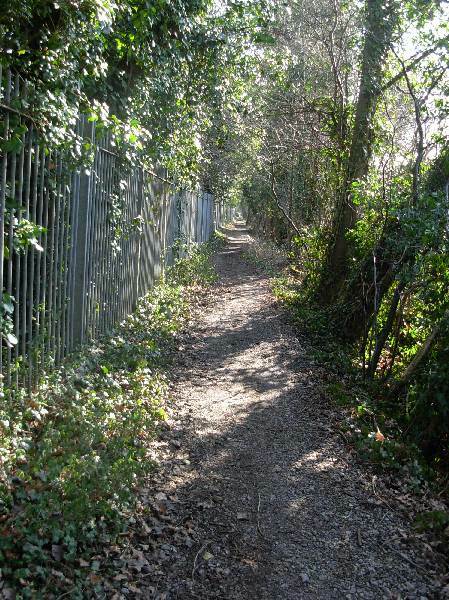 The footpath runs along the train line southwards. You probably do not notice anything special about this main train line. Europeans will immediately wonder about this main trunk line not being electrified as they expect overhead power supply rather than the third rail system used on most lines in England. The third rail is cheaper to build but implies a safety risk (in case of trespassing, evacuation of a train or works) and is cumbersome to maintain. The speed reduction caused by falling leaves in autumn sounds like an outrageous joke to people living in Paris or Berlin. Indeed, the Paris regional system called RER and the Moorgate to Hertford line in northern London switch from overhead to third rail only once they reach sections that are fully underground. The tram stop was created in 2000, opening with the tram line. 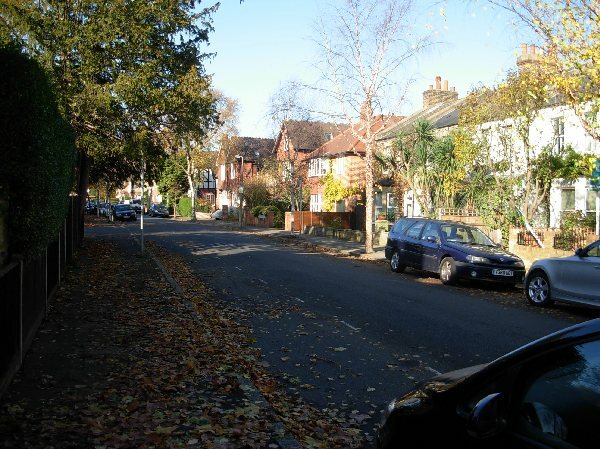 This residential road leads across a conservation area, a sensible designation considering the nice houses and the trees lining the streets. This suburb was built on farmland bought by John Innes, a businessman who decided to settle here. He is an interesting character: his parents had plantations in Jamaica making them rich but ended up selling out in order to get free of the moral dilemma of having slaves; he did not marry and his estate funded a school of horticulture. 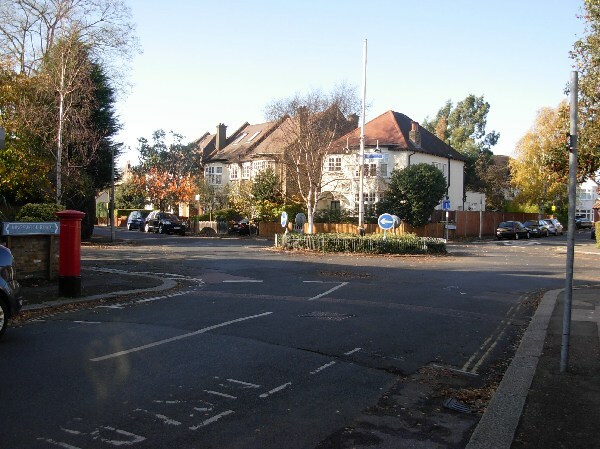 The suburb was developed according to the guidelines of the garden suburb movement and catered from the onset to the more genteel middle class. You might notice a conspicuous brick building on Kingston Road. The small entrance door at the corner is worth a look as it is a prime example of art déco from the 1930s. The sunray motive is typical but is seldom attempted in bricks. The lintel reminds a bit of Maya architecture in Central America and this is not surprising as reminders of the glory of the Empire (here British Honduras) were quite popular at the time. The tram stop was created in 2000, opening with the tram line. It is very close to an old train station also called Merton Park but there are no remnants visible from the tram stop. 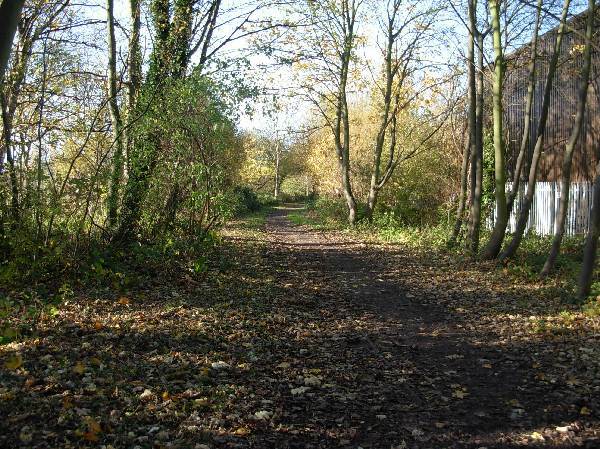 The footpath crosses a local nature reserve that corresponds to a minor train line that linked Merton Park with industrial premises near the current Colliers Wood Underground station. The area was made accessible in 1994, twenty years after the last train ran. It is interesting to see how much vegetation grows naturally over a period of some 40 years. 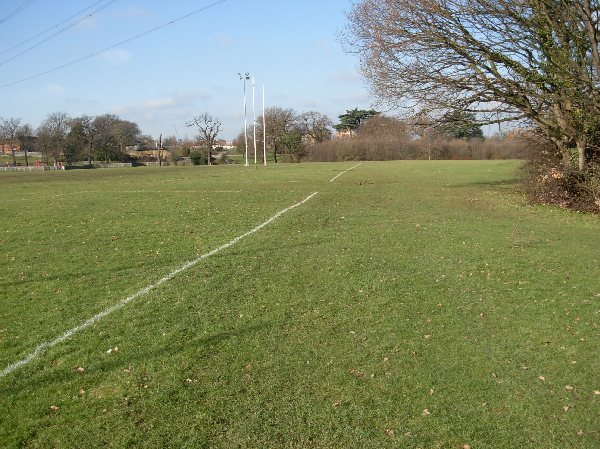 When the first fence ends, turn R across Abbey Recreation Ground. This minor green space has no amenities of particular interest. 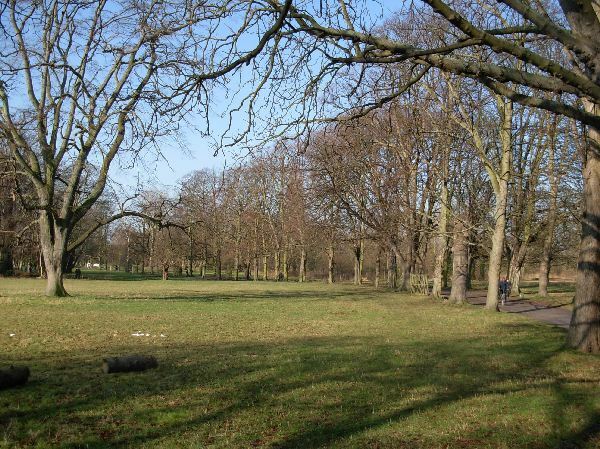 It is a remnant of the grounds of an estate sold in the mid 19th century to developers. Interestingly, the property was owned by Lord Nelson when he died in 1805; despite having been the home of a national hero, no one bothered much when it was demolished, which shows how differently our ancestors thought about heritage issues. The tram stop was created in 2000, re-using the site of an old train station also called Morden Road. There are no remnants of the train station. 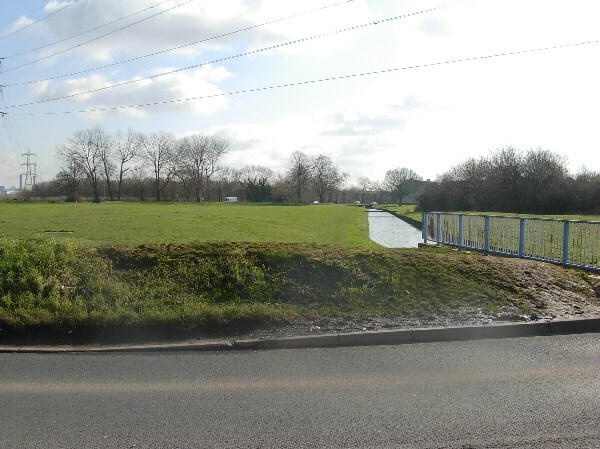 The footpath crosses a triangular area between the tram line, the main road and a marshy area along the river Wandle. There are several paths but you cannot get lost if you take care not to cross the train line. I recommend taking the left-hand path at the first opportunity. You can then cross a paved path and continue ahead onto a boardwalk that meanders through wetlands. 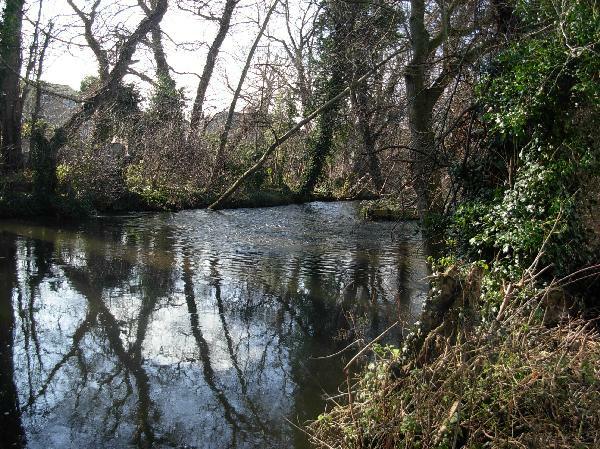 This area is covered in reeds because it is flooded on occasion by the river Wandle. It is obviously one of the core reasons for the park being an important nature reserve. 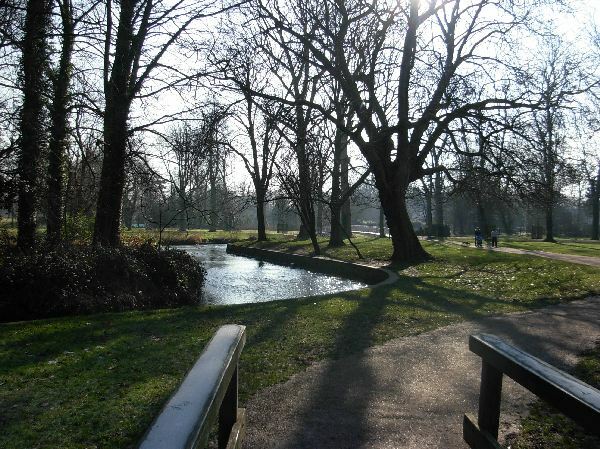 You are now in Morden Hall Park, a large property actually owned by the National Trust. It was originally an estate owned by the businessman who operated a nearby snuff mill. 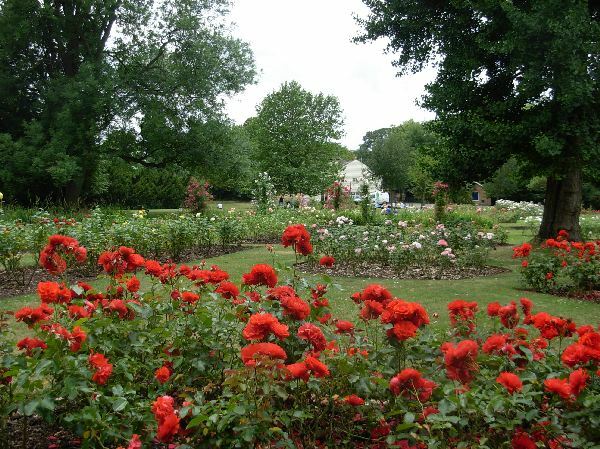 He lived in a suitable mansion and set a large park around it but gifted everything to the heritage organisation in 1942 in order to ensure that no development would take place. As usual with the National Trust, there are many panels with explanations all over the property. The boardwalk ends near small bridges. Turn right in order to cross the first two arms of the river and continue ahead. You pass on your right first Morden Hall itself, then the Stable Yard. 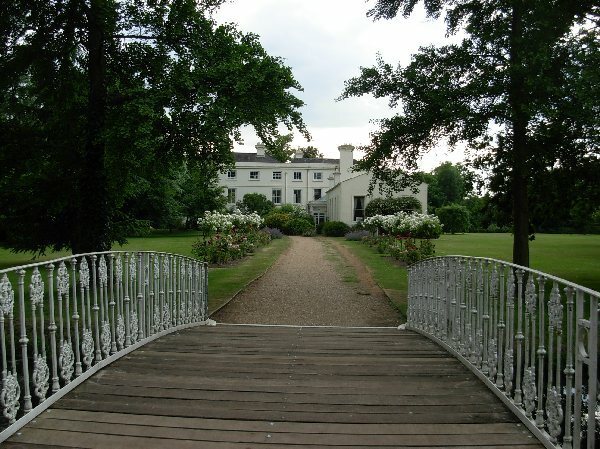 Morden Hall is now an elegant restaurant with some 19th century decoration. It sits in the middle of lawns and is enclosed by a moat. 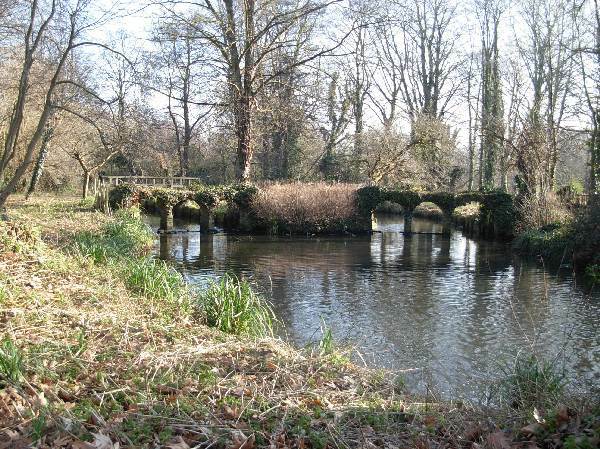 This is not a medieval feature, just an 18th century fancy, and the moat is fed by the river Wandle. The bridge over the moat is normally closed but is worth a look as it is an elegant Victorian cast iron bridge. The former stable yard a little further on is where you get information about the property. There is a gate under a clock tower. Such clocks were usual in Victorian estates as this was the way the staff knew when to do certain duties. We can understand easily that normal staff would not be able to afford pocket watches in the 19th century, but what is really interesting is that such clock towers were not customary in the 18th century, a more leisurely time when staff could be relied upon to follow natural times like sunrise and sunset. 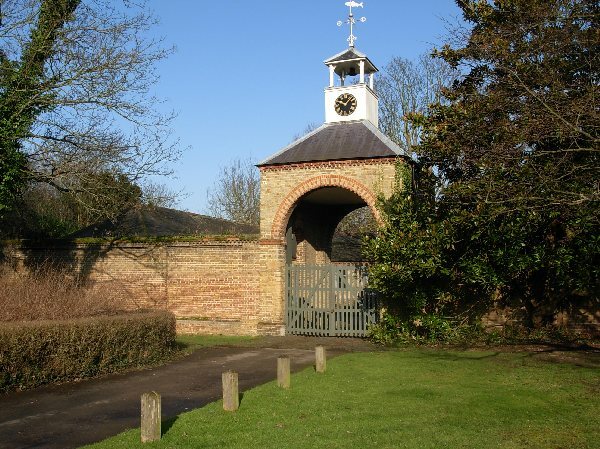 Part of the stables yard was a dairy, which could have been due to the borough using the property for grazing cattle in the mid-20th century. 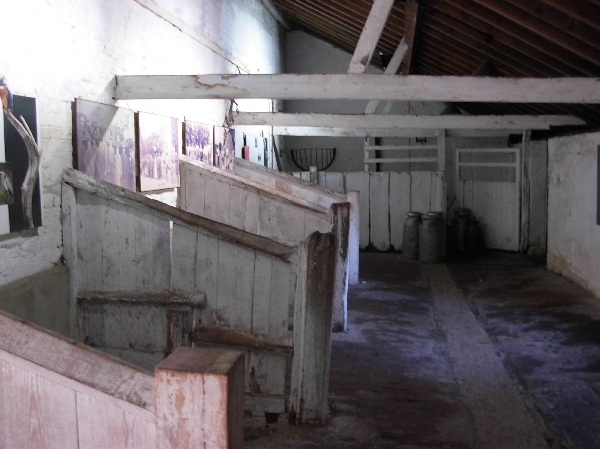 But dairies were also a normal occurrence in any large estate as it was the only way to ensure a supply of fresh milk. After the stable block, you reach the main access road. If you are interested in a bit of shopping, there is a National Trust garden centre and shop a few yards to your right. Otherwise, turn L across the river. The building directly astride the river was the snuff mill that provided Mr Hatfield with the means to purchase the estate. 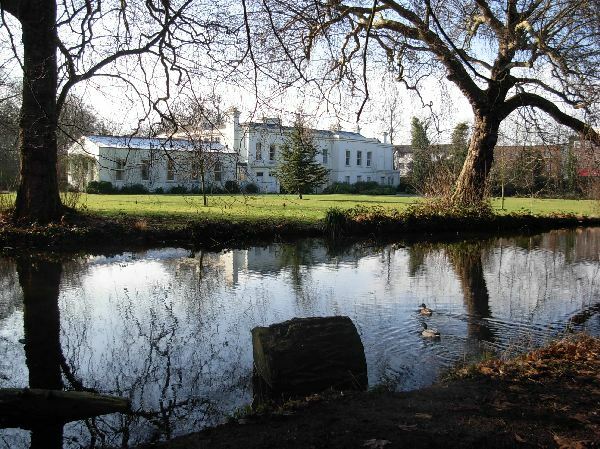 The larger house behind the mill was first a hunting lodge for the original deer park and was later turned into a residence for Mr Hatfield’s son. 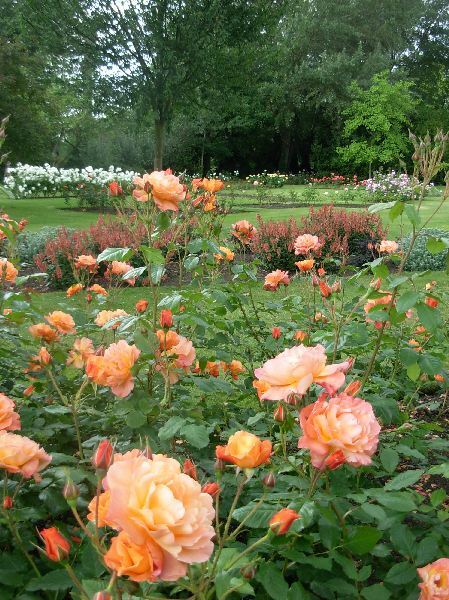 The house has a very nice rose garden in summer. Aim for the small bridge over a minor arm of the river and cross the river. 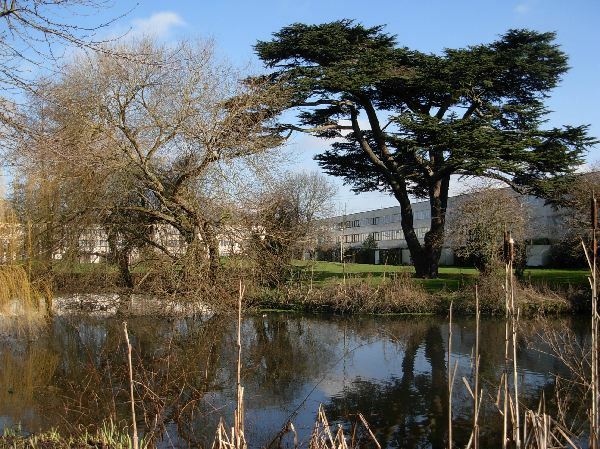 You might notice the row of impressive trees building a crescent away from the river. This was the original alley entering the property as it was fashionable to let visitors enjoy a view of the park before glimpsing the mansion. The tram stop was created in 2000, opening with the tram line. “Phipps” is a family name referring to a family influential in the late 18th century. 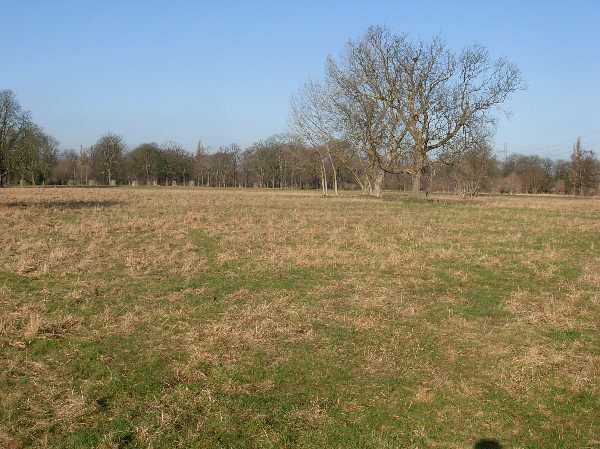 You are still in Morden Hall Park, but more in the landscaped section that would have been used in the 18th century for vistas and grazing. I did not detour to the parish church from which the road has its name. 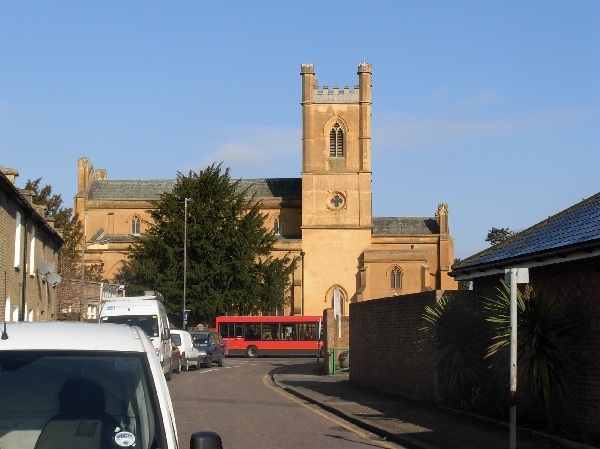 If you want to have a look, the church is a short distance up the street. The building dates back to 1821 and the architecture is a restrained version of neo-medieval. As classicism was still fashionable, involving unadorned walls and uncluttered lines, the church looks much less frilly than Victorian examples. 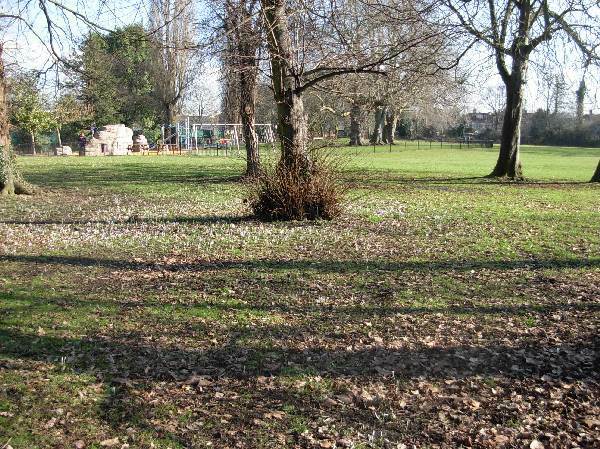 This is a plain green space with a small playground for children. There is a pleasant sitting area with a mysterious small sculpture in the middle. From afar, it reminds me of a Mayan petroglyph. 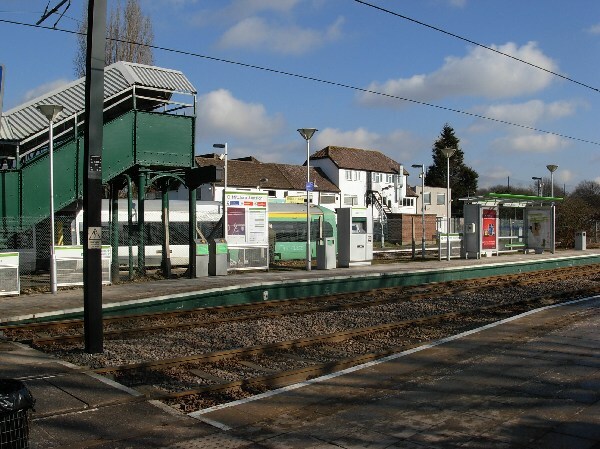 The tram stop was created in 2000, re-using the site of an old train station also called Mitcham. There are no remnants of the train station. You are entering here Ravensbury Park, a green space set on the grounds of two factories and the mansion of their owner. There are a few interesting panels giving details. The property was abandoned in the late 19th century when chemical colours killed the business of the local calico factory and the borough bought part of the grounds in order to keep some green space while the rest was developed. 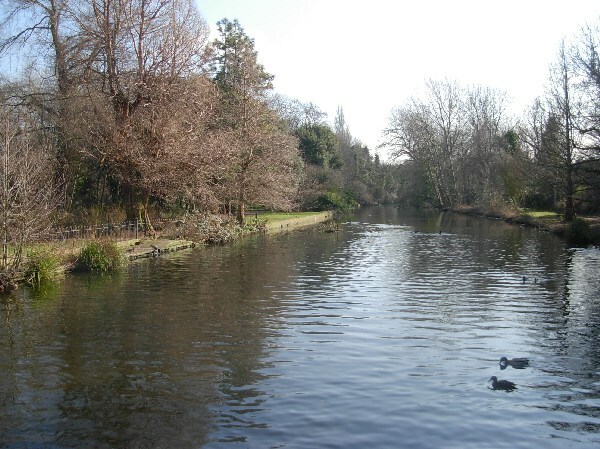 The park was opened in 1930, providing primarily a walk along the river Wandle, while the river was dammed in the 1970s in order to provide an ornamental lake. 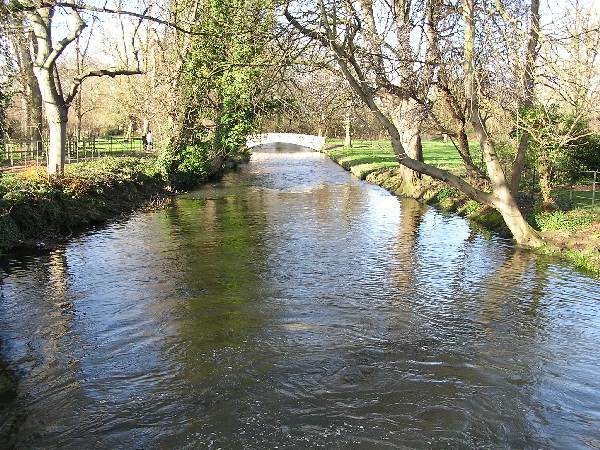 You are following here the Wandle Trail, a very nice walking and cycling trail running all the way from the Thames in Wandsworth to the river spring in Waddon with few interruptions. A beautification effort in the 2000s included markers, signposts and several unusual gates probably meant to force cyclists to slow down when reaching main roads. In this particular section, the path gives you a few glimpses of a housing estate from the 1970s to your left that is interesting to look at. 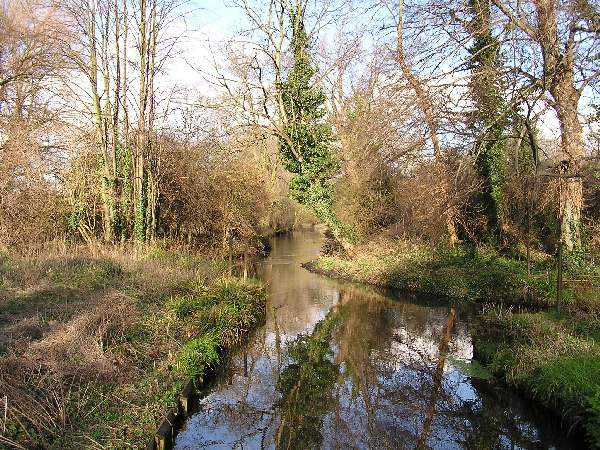 It is unusually low rise, with mature trees and a direct view to a side arm of the river. Definitely not a typical council estate. The path runs here along a sturdy fence instead of directly along the river. 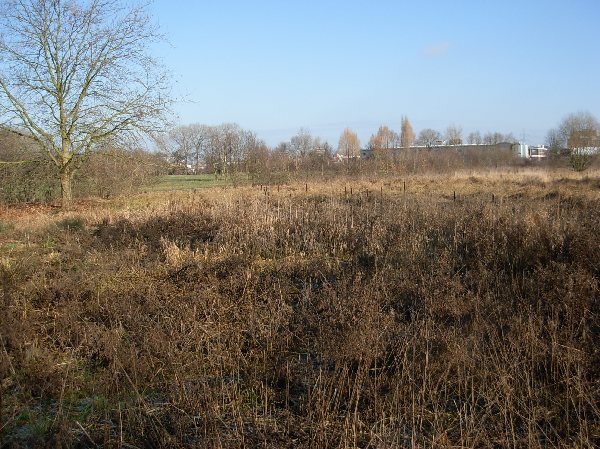 The area behind the fence, Watermeads, is a nature reserve. It is actually frequently flooded and it would not be sensible to build a paved cycle trail through it. 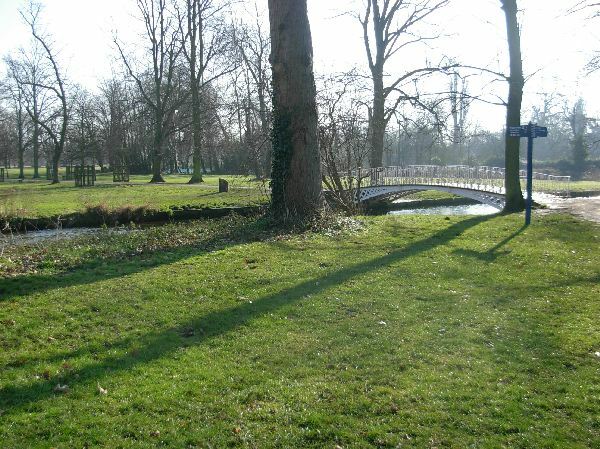 When the path reaches the riverside again, you enter Poulter Park, named after the gentleman who gifted the property to the borough. 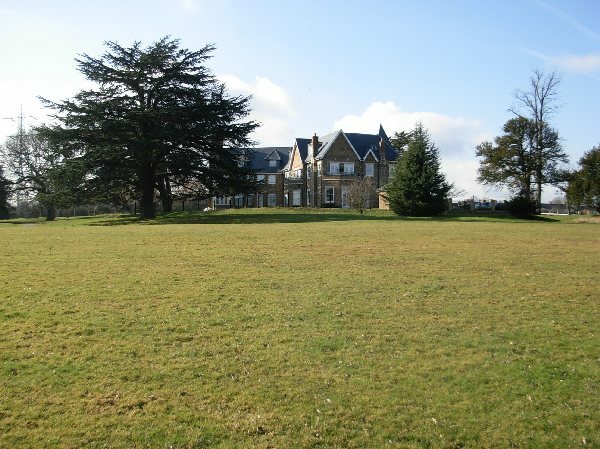 His 19th century mansion, Bishopsford House, stands on upper ground to your right, but what you see is actually a 21st century building as the original mansion burnt down in 2001. It is now a block of private luxury flats. 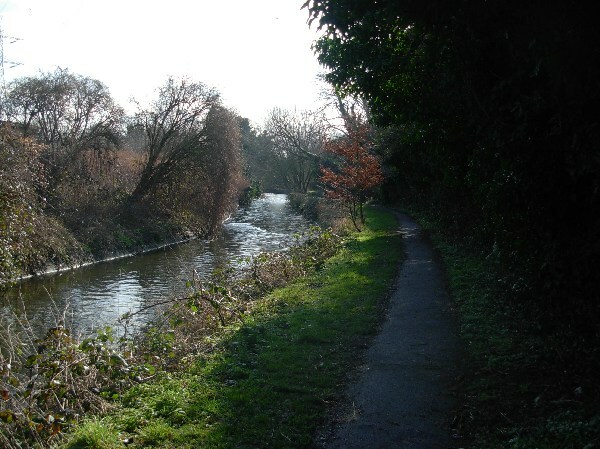 Follow the paved cycle path (the Wandle Trail) as it meanders along the river passing large playing fields. L on the road bridge across the river, you are now on Goat Road. This road soon runs along a large open space (on the right side). 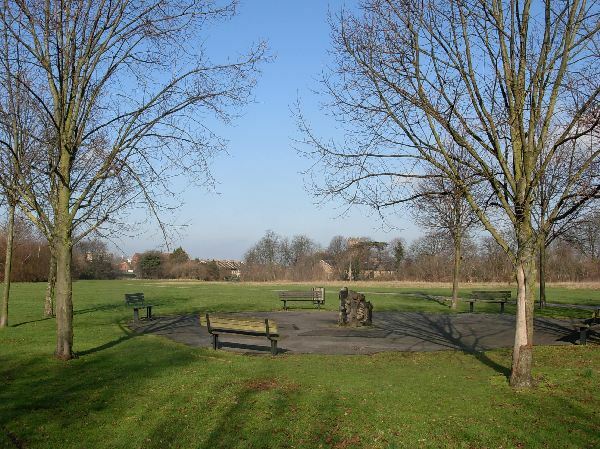 You can walk in the open space called Mill Green as long as you keep close to Goat Road. 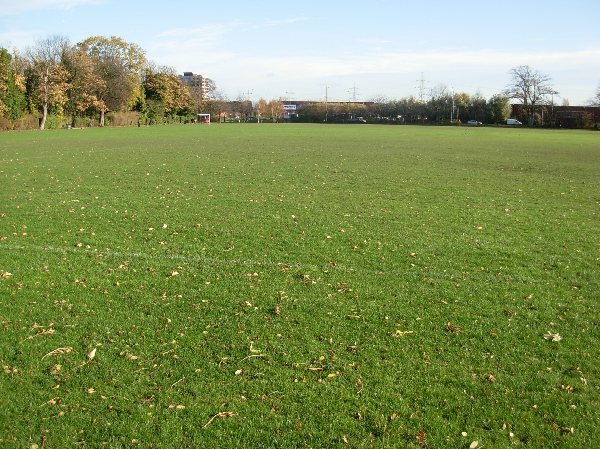 Being a green, it is just a plain expanse of grass without amenities. There is a canal running through it, confirming that the name comes from a former mill. At the large crossroads at the end of Goat Road, cross Goat Road and take a path along a row of houses. The path is parallel to the main road but is separated from it by a strip of greenery. 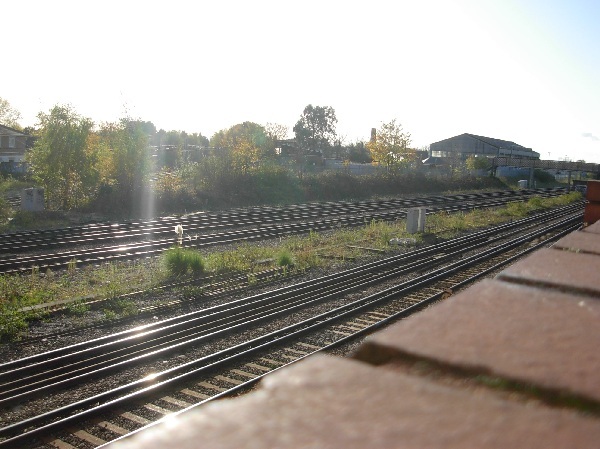 The station opened as a train station in 1868 when a new train line linking Sutton with Streatham was built, crossing here the older line from Wimbledon to Croydon. As no one lived nearby at the time, it was only built for interchange purposes. The tram platforms are located on part of the old station, but they are completely separate from the train network and there is no station building for tram travellers. This entry was posted in Croydon Tramlink. Bookmark the permalink.